Check out the floorplan to see the layout and room dimensions of this outstanding 5 bedroom, 2 1/2 bath expanded colonial with over 3, 000 square feet of living space. 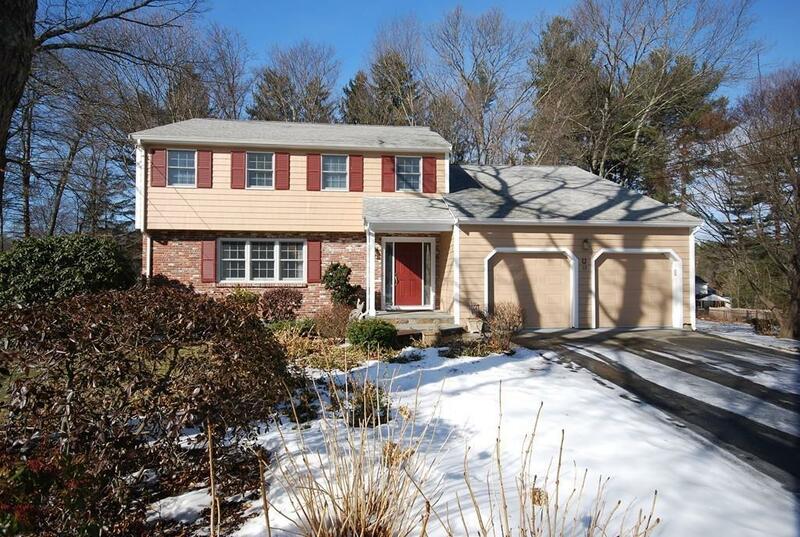 Set on a prime, flat 1/2 acre lot in one of Framingham's most sought after neighborhoods - WOODCREST ACRES - and beautifully maintained and improved upon by its longtime owners, this home entertains a crowd! Custom, enlarged kitchen with abundant cabinetry, center island, desk, corner sink, stainless steel appliances and granite countertops! Expanded fireplaced Family Room with Sunroom windows and stunning built-ins overlooks the wrap-around deck with hot tub and a manicured backyard! The step-down Master bedroom measures 21x14 and has a beamed cathedral ceiling, triple window and walk-in closet! There are updated Bathrooms, hardwood floors, Central A/C and a 2 car attached garage!! Recent Boiler, Hot water heater and oil tank! Finished basement! Entertain large crowds or intimate gatherings in the wide-open spaces.